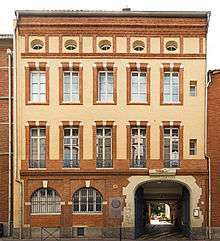 Located in the historic center of Toulouse, in buildings constructed between the fourteenth and eighteenth century, the Institute is shared between the various faculties and institutes. It has three auditoriums, a library, a chapel, numerous rooms, research laboratories, an archaeological and historical museums. Located on the site of the old house where Saint Dominic lived. The school shared its name with an ancient Catholic University of Toulouse, which St Dominc helped found in 1229 with Saint Thomas Aquinas, whose tomb lies the church of the Jacobins. An 1880 law forced private schools to stop using the name "University", the university has been known since as the Catholic Institute of Toulouse. The Catholic Institute of Toulouse is one of five universities founded by the bishops of France. The Catholic Institute of Toulouse is a member of the International Federation of Catholic Universities, which includes 200 Catholic universities across the world and is one of 5 French Catholic institutes, including with Angers, Lille, Lyon and Paris).